Astroloba is a genus of flowering plants in the family Asphodelaceae, native to the Cape Province of South Africa. The name of the genus is derived from the Greek words “astros” (star), and “lobos” (lobe), and refers to the starlike shape of the petals, which appear at the end of the tube-like flowers. 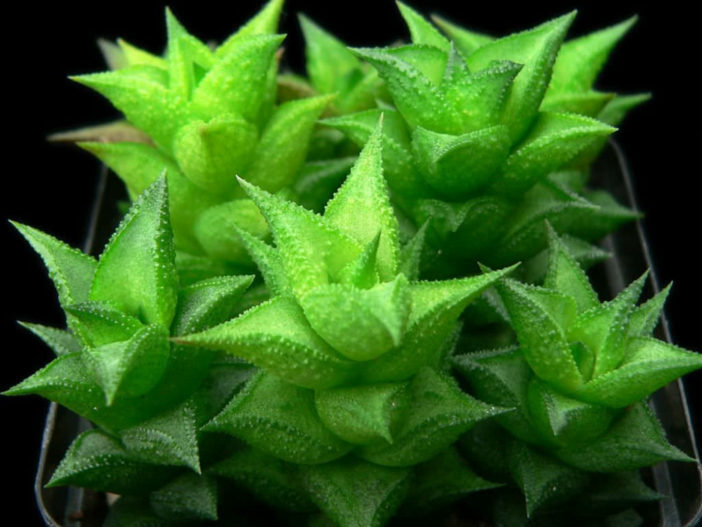 They are very closely related to the Haworthia genus, but are distinguished by their flowers being regular and not double-tipped. The flowers are small and white, and appear clustered on slender racemes. Astrolobas bear very regular, sharp, triangular, succulent leaves along their symmetrical columnar stems. They are slow growing, multi-stemmed, and their longer stems tend to sprawl in their rocky natural habitat. Unfortunately, when conditions are not ideal, occasional random leaves can die, shrivel up and go brown, all along its stem. This is unfortunate because, as explained, much of the beauty of the plants comes from the intricate, crystalline pattern of their leaves. However this disfigurement can be avoided by keeping the plants in optimal, fertile conditions – growing steadily and sheltered from stress. All Astrolobas can be propagated by seed, by cuttings/offsets, and by division of clumps. Cuttings or offsets should be dried for several days to weeks, in a cool, shady environment, before being planted in well-drained sand. Seeds should be collected and sown on well-drained soil. It is optional to cover them with a very thin, fine layer of sand. Keep moist until they germinate, and continue to water regularly until they are relatively large and strong. Keep in a bright spot, but out of direct sunlight. Hybrids can be made between all the Astroloba species (except for A. rubriflora, which has evolved a highly distinct chemistry in its flowers). Astrolobas can also be hybridized with other related genera, such as Tulista, Gasteria and Aloe.